IMPORTANT - Please read the full property description and booking information and policies below before submitting a Reservation Request. This property is being offered to rent by Beaches of South Walton Vacations, LLC. If you click on Reservation Request or Booking Request, you are attempting to make an actual reservation with Beaches of South Walton Vacations and not just inquiring about the property. To inquire about the property only, there is usually a link on this page that says Contact the Manager or Ask the Manager a question. The name of this studio is "Sans Souci" which means "No Worries." 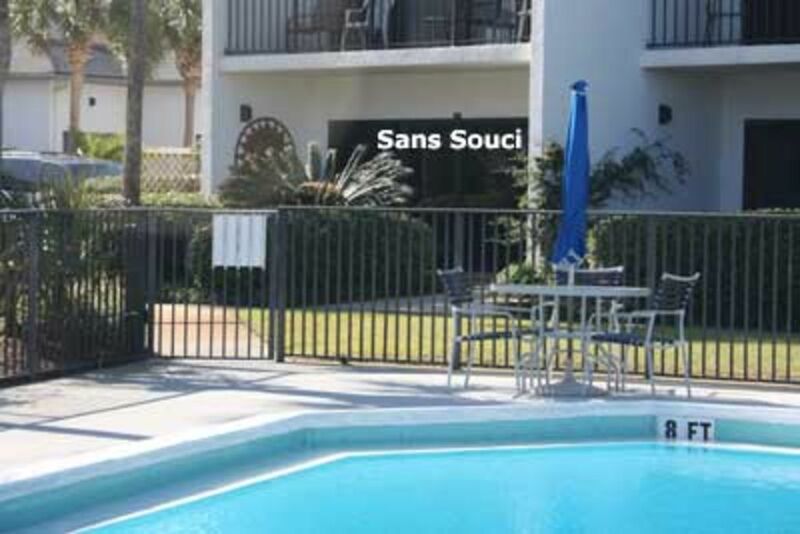 Sans Souci is a corner, ground floor, poolside unit that has everything you will need for a relaxing, carefree, and well-appointed vacation. It is literally only about a 90 second walk to the beach. A 4-night minimum is required over all major holidays except July 4th week is a 7-night minimum. A minimum age of 25 is required to rent and stay at the property. The unit can sleep two adults in the queen Murphy bed. An extra child is o.k. if they still sleep in a crib or pack-n-play, can share the bed or otherwise can sleep on top of the couch. Pets or smoking are not allowed at the property. Trailers of any kind, boats, or RV's are prohibited. Reservation requests are not fully confirmed until a representative from Beaches of South Walton Vacations reviews our policies verbally with the inquiring party. This must be done within 24 hours from the time a Reservation Request is made. After submitting a Booking Request, please watch for our message, as you will need to reply to it. We require full payment when booking through the Vrbo/Homeaway advertising site. You can elect to purchase Travel Protection Insurance. If you do not purchase travel protection insurance through the Vrbo/Homeaway advertising site, we provide information about travel insurance in the materials we send after a reservation is made, and you can check into it later if you would like. If you purchase travel insurance, the insurance company can sometimes reimburse you for monies lost should you need to cancel for an emergency. We do not charge for a damage deposit in advance and do not require you to purchase Damage Protection Insurance that would cost you extra, however, we do require that a valid MasterCard, Visa, or American Express be held on file at the Beaches of South Walton Vacations rental management office to have for any damages that may occur during your stay. This is required even if you choose to purchase Damage Protection Insurance that is offered to you from the Vrbo/Homeaway advertising site. Beaches of South Walton Vacations, LLC is a Trusted, Locally Owned and Operated Rental Management Company currently in our 11th year of business, so you can feel confident when staying with us. We have also been a customer/advertiser on VRBO/Homeaway for 11 years! If you have any questions about this property, please click on Contact the Manager or click Ask the Manager a question to reach Beaches of South Walton Vacations, and we will be happy to answer any questions you may have. Thank you! Bath linens are provided. Please bring your own beach towels. The studio has an Ipod Player. Bath linens are provided, but please bring your own beach towels. For your convenience, we provide a starter supply of household items such as bath soap, shampoo, toilet tissue, paper towel, and garbage bags. The property was as advertised. It was very clean and the kitchen was well stocked. The condo is quite small, however, better than staying in a hotel. Great location, very close to the beach. Grocery store, shops, and restaurants all close by. The bed was very comfortable and really wasn’t a bother as a Murphy bed. Our only complaint was the stools, no back to them and after awhile they became uncomfortable. As a whole we enjoyed our stay and would recommend staying there. Small but perfect unit for two. Comfortable and very well equiped. Everything you need for an easy stay. The beach access is so close and views of the ocean are wonderful from the little outside patio. Very clean and updated. Beautiful property, great pool and beach! We had a wonderful time and the condo was just perfect for our little family. We are planning fo come back next year! The space is small but had everything we needed; we were here to spend the majority of our time on the beach anyway. The bed is the biggest issue: It's not very comfortable, and it slopes down in the center to create a valley. I suppose we could've tried it on the floor, but it would still be uncomfortable. The two chairs were too clunky to move around much; they definitely got in the way when the bed was down. The curtains that hung in front of the bed when it was up were visually nice, but, when the bed was down, got in the way of climbing in and out of bed, particularly with the large chairs in the way. Some plates had dried bits of food on them, and there were two potatoes (not ours) in the oven from a previous visitor. Perhaps I didn't use it correctly, but the combo washer/dryer did not dry our clothes. It was warm enough, though, to drape the clothes across the patio furniture to dry. We never used the counter that stuck out from the wall or the bar stools; I'd recommend that the counter be made into a model that could fold up to the wall when not in use. The ad says the space might be suitable for one child, but I personally would not want to bring a child unless he/she were older, say at least eight, because the unit is small and the adults would probably keep a younger baby awake, if that makes sense. The price: enough said. Check-in and check-out were very easy. Instructions were emailed beforehand, and we were given the code for the lock box in advance and didn't have to go to the office at all. The unit is just steps from private access to the beach. We were able to run up and down easily to our condo as needed. It's also twenty feet from the pool, which we didn't have the need or time to use. We did enjoy the extra space when the bed was up during the day, and the bed isn't hard to put up or bring down. The kitchen was adequately supplied with appliances (including coffee maker and toaster), dinnerware, drinkware, and cooking utensils. The bathroom was just fine, what you would expect. The couch and two chairs were comfy enough; we used the pillows from the couch and slipped them behind the head of the Murphy bed to keep our bed pillows from falling. Perfect location! We were steps from the ocean, and the pool was right outside our door! Wonderful! The property was very nice. It was very clean and well kept. Julie was very helpful when we arrived. I would have given it 5 stars except the drain in the tub did not work well, and made showers a little bit of a pain, and there was very little storage in the condo. Otherwise everything was very, very nice. What an adorable, cozy little place! Our first time staying in a studio and our first time sleeping on a Murphy bed and we have no complaints! It was actually a perfect little set-up with everything all in one room! And the bed was surprisingly very comfortable! Clean and quiet, too---we normally don't choose the bottom level of a condo, but it was very nice to look out of your door and see palm trees and the pool. And once you step onto your patio, just look to your right and there's the beautiful emerald/turqouise waters of the Gulf! Well maintained property--saw landscapers, pool guy, cleaning crews,etc. A place to park our bikes was just outside our condo, which was nice. We may have found our new place to stay each trip!! ***And when they say checkout is at 10, they mean it! ;)--We were walking out of the door at 10 and attempting to lock it when the cleaning lady walked up and was ready to get inside for the next renter's arrival. We plan to return to Sans Souci at Emerald Hill! Emerald Hill is a beautiful, beachfront condo in the heart of Seagrove Beach Florida that is a short walk, bike ride, or drive to plenty of fabulous restaurants, excellent shopping, bike trails, golf, and more. A minimum age of 25 is required to rent and stay at this studio. The maximum number of people that may occupy the unit including adults and children is 2 adults and 1 child if the child still sleeps in a crib or pack-n-play, sleeps on top of the couch (sheets and protectors are not provided), or shares the bed with their parents. The couch is not a sleeper. Pets or smoking are not allowed at the property. The total does not include beach chair and umbrella service. Parking is allowed for one vehicle only. Trailers of any kind, boats, or RV's are prohibited. Booking requests are not fully confirmed until a representative from Beaches of South Walton Vacations reviews our policies with you verbally. After you submit a Booking Request please watch for our message as you will need to reply to it. We do not charge for a damage deposit in advance and do not require you to purchase Damage Protection Insurance that would cost you extra, however, we do require that a valid MasterCard, Visa, or American Express be held on file at the Beaches of South Walton Vacations rental management office to have for any damages that may occur during your stay. This is required even if you choose to purchase Damage Protection Insurance that is offered to you through the Vrbo/Homeaway site. Beaches of South Walton Vacations will only charge your card for damages if they are discovered after your stay. Beaches of South Walton Vacations, LLC is a Trusted, Locally Owned and Operated Rental Management Company currently in our 11th year of business, so you can feel confident when staying with us. If you have any questions, please click Contact the Manager or Ask the Manager a Question to reach us.